Our event with Susan Froderberg has been cancelled. Please accept our apologies. 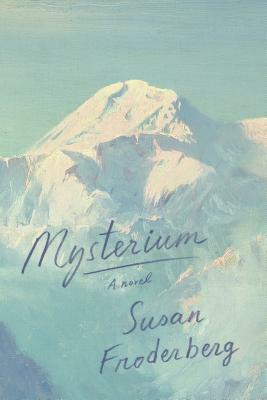 Mysterium, known as Mount Sarasvati, looms over the Indian Himalayas as the range’s tallest peak in the dazzling fictional world Susan Froderberg has created. Sarasvati “Sara” Troy is determined to reach the peak for which she was christened, and to climb it in honor of her mother, who perished in a mountaineering accident when Sara was just a child. She asks her father, a celebrated mountaineer and philosophy professor, to organize and lead the expedition.The six climbers he recruits are an uneasy mix. They include his longtime friend Dr. Arun Reddy, a recent widower, and Reddy’s son, who often challenges his father; Wilder Carson, the acclaimed climber who is tormented by the death of his brother; Wilder’s wife, Vida, a former lover of Dr. Reddy; and the distinguished scholar of climbing Virgil Adams and his wife, Hillary. Porters and Sherpas are recruited in India to assist and be part of the team. The party’s journey is harrowing, taking them from the mountain’s gorge, into its sanctuary, and finally onto the summit, a path that evokes the hell, purgatory, and heaven of Dante’s Inferno. As the air thins and this unforgettable journey unfolds, Sara emerges as a Beatrice-like figure, buoying her companions up the mountain through the sheer strength and beauty of her being. Both monumental quest and dreamlike odyssey, Mysterium is infused with the language of climbing and profound existential insight. Katherine is seventeen, living alone in the beautiful, desolate landscape of southern Arizona. Her mother is feckless, her father busy up north with his new family. Meeting Son, the scion of a local rancher, seems like deliverance.